space. The anatomic boundaries of the retropharyngeal space are the middle layer of the deep cervical fascia (abutting the posterior esophageal wall) anteriorly and the deep layer of the deep cervical fascia posteriorly. These two fasciae fuse inferiorly at the level between the first and second thoracic vertebra. The common differential diagnosis of retropharyngeal abscess are cervical osteomyelitis ,Pott’s disease, meningitis and calcific tendonitis of the long muscle of the neck. The onset of a retropharyngeal infection may be insidious, with little more than fever, irritability, drooling, a muffled voice (dysphonia), or possibly nuchal rigidity. The acute symptoms relate to pressure and inflammation produced by the abscess on either the airway or the upper digestive tract and pharynx. The patient may have intense dysphagia, drooling, and odynophagia, or there may be some element of respiratory distress from edema and inflammation of the airway (stridor, tachypnea, or both). Unwillingness to move the neck because of discomfort is often a prominent presenting feature and should lead to consideration of retropharyngeal abscess if the child is febrile and irritable. Extension of the neck is usually affected more than flexion. This causes the patient to hold his or her neck stiffly or to present with torticollis. On physical examination it may be possible to appreciate midline or unilateral swelling of the posterior pharyngeal wall. The mass may be fluctuant to the examining finger, and care must be taken to avoid rupture of the abscess into the upper airway. Retropharyngeal abscess occurs most commonly in children between the ages of 2 and 4 year, analogous to suppurative cervical adenitis. This represents the peak age group for numerous viral upper respiratory tract infections and their attendant complications, acute otitis media and sinusitis. 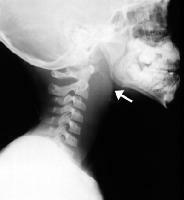 Retropharyngeal space infection is less common in older children and adults because the lymph nodes atrophy by the age of 3 or 4 year. The predominant bacterial species are Streptococcus pyogenes (group A Streptococcus), Staphylococcus aureus, and respiratory anaerobes (including Fusobacteria, Prevotella, and Veillonella species). Haemophilus species are also occasionally found. In young children, infection usually reaches this space by lymphatic spread from a septic focus in the pharynx or sinuses.In adults, infection may reach the retropharyngeal space from either local or distant sites. Penetrating trauma (e.g., from chicken bones or after instrumentation) is the usual source of local spread. More distant sources of infection include odontogenic sepsis andperitonsillar abscess (now a rare cause). Complications are numerous and could be fatal;these include airway obstruction, septicemia,thrombosis of the internal jugular vein, carotid artery rupture, and acute necrotizing mediastinitis. Aspiration with resultant pneumonia may complicate retropharyngeal abscess if rupture of the abscess occurs and empties into the airway. Infection can spread from one space in the neck to another.The most dreaded complication is jugular vein suppurative thrombophlebitis (Lemierre’s syndrome), in which the vessels of the carotid sheath become infected, leading to bacteremia and metastatic spread of infection to the lungs, brain, and mediastinum. A lateral neck film may be helpful in delineating the presence of a retropharyngeal abscess and may demonstrate cervical lordosis; the retropharyngeal space is considered widened and pathologic if it is greater than 7 mm at C2 or 14 mm at C6. There must be attention to technical issues when performing the study, especially in children. The film should be a perfect lateral, and the child must keep the neck in extension during inspiration to avoid a false thickening of the retropharyngeal space. Crying, particularly in infants, may also cause false thickening of the retropharyngeal space. A CT scan of the neck is the best tool to identify abscesses in the retropharyngeal area, but it is not perfect. Both the sensitivity and specificity of the CT scan in predicting the presence of drainable purulent material are quite variable from study to study. on the posterior pharyngeal wall. the soft tissue component. Finally, MRI is useful for imaging vascular lesions, such as jugular thrombophlebitis. abscess in conjunction with antibiotic therapy. Drainage is indicated when there is a large hypodense area or when a patient has not responded to parenteral therapy alone.